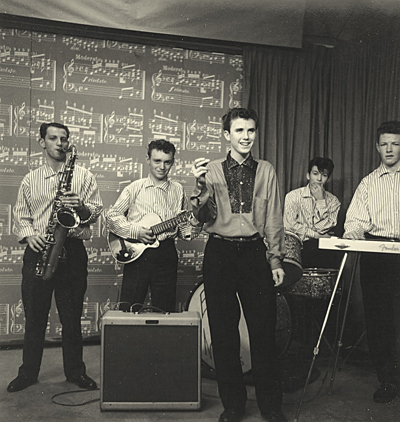 THE BLUENOTES were the very first white teenage rockin’ band to emerge in Tacoma back in the 1950s. Founded in 1958 by Bill Engelhart (guitar, vocals), John “Buck” Ormsby (steel guitar), Frank Dutra (sax), Buck Mann (sax), and Lassie Aanes (drums), they took their name from another Tacoma band, the Blue Notes, comprised of older African American players that Engelhart had jammed with a few times at dances held for adults. The young players also modeled their multiple-sax format after the raving bands led by R&B stars like Fats Domino and Hank Ballard & the Midnighters, – even adding Tom Giving (sax) a bit later – rather than exploring an Elvis or Buddy Holly-type sound. For a while there, the Bluenotes were the only game in town and local kids loved their R&B sound – but then a crosstown-rival situation arose with the formation of another teen combo, the Wailers. But as the Wailers’ early sound was more aligned with the twanging guitar hits of Duane "Rebel-Rouser" Eddy, and the honking sax of the Champs' "Tequila," they soon managed to overtake the Bluenotes in general popularity and also began to dominate the emerging teen-dance circuit. So, the Bluenotes did what they needed to in order to draw crowds: they pioneered a D-I-Y approach by renting halls, posting posters that they’d had printed, and promoting themselves however they could. One night the Tacoma Police tried to shut down a dance because the hall was clearly over-capacity. The kids started to get rowdy and Engelhart convinced the cops to let the band play one final song before the hall was emptied. But the Bluenotes – who had added a new singer named “Rockin’ Robin Roberts [as seen here, fronting the band on Tacoma's Bill & Grover's Variety Show] -- chose to play an endless version of Richard Berry’s 1956 tune, “Louie Louie,” and the authorities were not pleased. Next thing you know, the City Council passed a new ordinance that made it difficult for the band to play within Tacoma’s city limits. So, they proceeded to locate a little hamburger hut, called the Little Gem, which stood just outside the city line, and kids flocked to the place to attend their dances. Meanwhile, Ormsby finally upgraded from playing rumbly bass runs on his Fender steel guitar, and bought an electric Fender bass guitar – one of the very first in the region. Long story short, Seattle’s Dolton Records – the same label that were scoring with the Fleetwoods, Frantics, and soon the Ventures – liked the tune and quickly issued it as a single credited to “Little Bill and the Bluenotes” – a change of emphasis that Roberts surely didn't like. “I Love An Angel” broke out as a regional radio hit, and then entered Billboard magazines national Hot-100 charts in June. Meanwhile, as more and more attention was being heaped on Engelhart by Dolton, Roberts was invited to join the Wailers. Then, after Dolton began sending Engelhart out on tours without the band (using pick-up bands along the way), Ormsby also joined the Wailers. Little Bill and the Bluenotes carried on with new members, but by 1960 even Engelhart moved on, recording one single (“Sweet Cucumber”) with the backing of the Frantics, and also joining a popular and very talented Auburn-based band, the Adventurers. It was while with this group that in about March of 1961 he recorded a version of “Louie Louie.” Ever the rivals, though, the Wailers caught wind of this and rush-released theirs and Roberts’ version which had been languishing in the can for a half-year. While Roberts and band enjoyed seeing their disc become a huge #1 regional radio hit, Engelhart saw his disc sink into obscurity. But, he stuck with the music biz, recording more singles, cutting his The Fiesta Club Presents… album in 1964, going country for a spell, and even working retail in one of Seattle’s University District music shops for a while. But, in time he returned to the nightclub world and over recent decades has become a pillar of the Northwest blues community, playing gigs relentlessly, working with the very best players around, and recording a long series of fine cassettes and compact discs. Text copyright © 2014 by Peter Blecha.